I was so used to my wonderfully, natural well water in Ohio, then here in KY, though we are in the country.. we have city water. Bleck! I don't drink enough water, and I know part of that is because I don't like the taste. Adding lime or lemon to my water helps alot, but I don't care to be drinking water and swallow seeds either, so I typically don't bother with it. 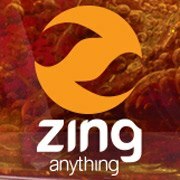 Zing Anything is the maker of the Citrus Zinger is one of those products you smack your head and say "Why didn't I think of that"! Such a wonderfully easy product to use! Made with the increasingly important BPA free plastic, the Citrus Zinger is a great on the go water drinker. You simple cut your fruit, zing it on the bottom fruit squeezer and leave it there to flavor your water. The bottom stays on securely and the water funnels down to grab some of the yummy citric goodness. Finally I was excited about drinking water again! Each half of a lime lasts for about 2 bottles of water or 56 ounces. If you keep it in the fridge you can reuse the lime for up to 3 days. I just went ahead and bought a bag full of limes and I am loving my naturally fresh water without having to purchase special bottled water and have the waste of the plastic bottle. Eco friendly and natural! Try it with limes, lemons, oranges. Specifically made for citrus fruit. Comes in green, orange and pink. Enter to win your own Citrus Zinger! What fruit will you try first? I'd love to try the AquaZinger! I'd love the Salad Zinger. The Salad Zinger is pretty awesome! I would love to have the Salad Zinger, it would be great. I like that they are marketing the salad zinger as an alternative to butter. I also enjoy the use of the word merch. I'd love to try the aqua zinger. I add lemon juice to my water bottles, but this would be a healthier tastier option. I really like the citrus zinger! I'd also love to have the aqua zinger. What a great idea! I like the aqua zinger and salad zinger. Wow, the salad zinger looks pretty great too! I like the salad zinger! I would love to try Aqua Zinger - I like that the ">>>> Zing Anything line, there is no plastic to recycle, no batteries, and no filters to change or throw away. Each Zinger is an environmentally-friendly, green product that is easy to clean"
I would like to try the Salad Zinger! I'd love to try the Salad Zinger! I would like to try the Aqua Zinger. I'd like to try the Aqua Zinger. I like the The Aqua Zinger because I can use my own fresh herbs in it. another product I would like to have is the Saladzinger! Since hubby is Guatemalan, limes and lemons are a big thing here in my household, so I will definitely have to check out this CitrusZinger! They seem like such a fun, natural way to drink water! I'd like to try the water and salad zingers! I'd like to try the salad zinger.